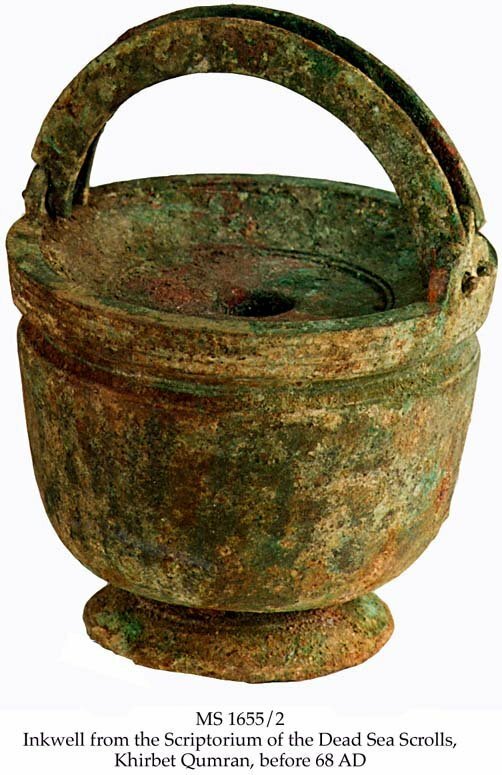 Description	 Bronze inkwell, Khirbet Qumran, before 68 AD, with 2 basket type handles turning opposite direction on the concave top, round corpus, h. 8 cm, diam. 8 cm, with pedestal base, decoration of parallel incised lines around rim and around ink hole. Green patina. Context	 Found 1950 on the Khirbet Qumran site prior to the official excavations, together with a bronze miniature incense altar with 4 protruding horns at the corners, MS 1655/4. 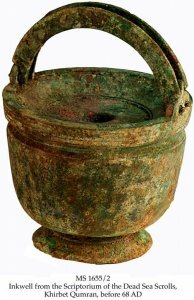 4-5 other inkwells in bronze and clay were found during the excavations at Khirbet Qumran in 1951, 1953 and 1966-67. There exist only 2 more inkwells of the elaborate type of the present item. MS 1987/15 and one published by Nabil I. Khairy, Inkwells of the Roman Period from Jordan, in Levant 12(1980), pp. 155-162, figure 5a and plate 25D. Provenance	 1. Community of the Essenes, Qumran (until 68 AD); 2. Khirbet Qumran site (68-1950); 3. Members of the Ta'amireh tribe, Judaean desert (ca. 1950); 4. Khalil Iskander Shahin ("Kando"), Bethlehem (1950-1953; 5. John Marco Allegro, Oxford and Manchester (1953-1963)? ; 6. Private Collector, USA (1963-1975); 7. Fayez Barakat, Los Angeles, Cat. VI F.Z. 181(1975); 8. Mathias Komor, New York (1975-); 9. American Collector (-1992); 10. David Goldstein, Los Angeles (1992-1993). Commentary	 One of the inkwells found in Khirbet Qumran, and itcontains remains of a carbon ink (lampblack and gum), of the type used on the Dead Sea Scrolls. The 2 inkwells found in the "scriptorium" were of a plain cylindrical Roman type, another had a single vertical handle, while the present one is much more elaborate in the execution. Published	 Stephen Goranson: Qumran, a hub of scribal activity?, in: Biblical Archaeology Review, vol. 20 no. 5 (Sept./Oct. 1994), pp. 36-39. The other Qumran inkwells are widely published by de Vaux, Allegro, Steckoll, Goranson and others. Exhibited	 1. Treasures from the Dead Sea. Manchester museum, 1997; 2. XVI Congress of the International Organization for the study of the Old Testament. Faculty of Law Library, University of Oslo, 29 July - 7 August 1998.